How about posting images of your neighborhood, home, animals, foods, etc. what ever pictures you would like to share. 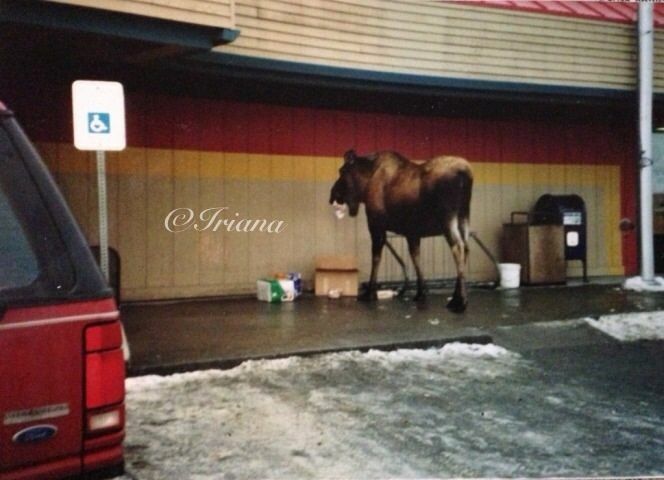 I'll start by posting a picture of a local moose eating somebody's groceries outside the Safeway store. The man went inside the doorway for a moment while waiting for a taxi. The moose boldly took advantage of the situation and started to eat the man's groceries. LOL. Nothing he could do but wait for the moose to be done. Moose is bigger and they can kick straight forward, so you stay out of their way. LOL. I hope you like this image and will post of your own here. "Half House". This strange half house is in Alaska. Five "stories" high, and an unofficial land mark. LOL. Love the moose photo. I'm glad I won't have that problem! Glad you love the image. It's an interesting and unusual problem. I'm glad you and (me too) don't have that problem. A photo I took today. This oak seems to have held on to every leaf. Those trees keep their leaves till spring when the new leaf buds will release them. I use this picture as my iPad wallpaper. Nice shot. Interesting that it's the only one with leaves. Is it also the last one to get leaves in the spring ? Ooh, it looks good. Would make me want to eat every time I saw that. LOL. I took this picture of an Alaskan Food Cache. A place to store your meats during the cold, freezing winters. They are built high enough to keep bears and predators from reaching the food. Not many of these in use anymore. Maybe some are still used way up north.